HOW’S THAT OBAMACARE HOPEY, CHANGEY STUFF WORKING OUT FOR YA AMERICA? UnitedHealth Group plans to withdraw from many Obamacare exchanges leaving them only in a handful of states. Due to tremendous loses UnitedHealth plans to withdraw from health insurance marketplaces in Arkansas, Michigan, Connecticut and parts of Georgia. They are expected to lose $650 million in the exchanges in 2016 and due to these deep loses may leave the Obamacare exchanges altogether in 2017. We warned you from the outset of this fool-hearty, government take over of healthcare that Obamacare was a lie and affordable. The fact that Obamacare is really called the Affordable Health Care Act may just be one of the greatest lies and hoaxes every perpetrated on the American People. 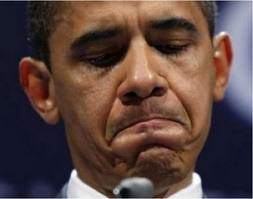 Recently insurance carriers warned that Obamacare was unsustainable. As the Right Wing News opines, “If only someone had predicted this …”. UnitedHealth Group, the nation’s largest health insurer, said Tuesday that in 2017 it will exit most of the 34 states where it offers plans on the Affordable Care Act insurance exchanges. “We will be down to a handful of states that we will be actively participating in the exchanges,” Stephen J. Hemsley, chief executive officer of UnitedHealth Group said in an earnings call, noting that the small market size and greater expense of patients insured through the marketplaces led the insurer to make the decision. FOX News Host Andrea Tantaros responded to Barack Obama’s tears on gun control by saying, I would check that podium for a raw onion or some “No More Tears.” It’s not really believable. On Outnumbered, watch the VIDEO where all of the cast respond to Obama’s comments and his continued divisive nature. But once again in a time when Americans are fearful terrorism, want to defend themselves and respect the Bill of Rights of the U.S. Constitution while Obama mocks all who do not agree with his liberal agenda. Really, after all this time, this lame duck president is making this an issue as if he cares? FOX News host Andrea Tantaros responded to Obama’s tears today during his gun control push. “This is how many years? Eight years, he’s almost at the end of his term. And you haven’t heard him go to Chicago and speak out about this issue and he is uniquely poised to do so. But everything he’s doing won’t solve that problem. So I would check that podium for a raw onion or some “No More Tears.” It’s not really believable. So is FOX News going to suspend her too for making such a comment of the Obamamessiah? YAWN … My how the mighty have fallen, it would appear many folks have lost that Obama Luvin’ feeling and are just bored to tears with Him. Barack Obama made a rare appearance on the campaign trail on Sunday in Upper Marlboro, Maryland, near Washington for Lieutenant Governor Anthony Brown of Maryland, who is running for governor. Ever wonder why President Barack Obama has been AWOL from the campaign trail in 2014, well wonder no more. As Obama begged the audience for their vote, a steady stream of people walked out of the auditorium while he spoke. OUCH, That’s going to leave a mark. 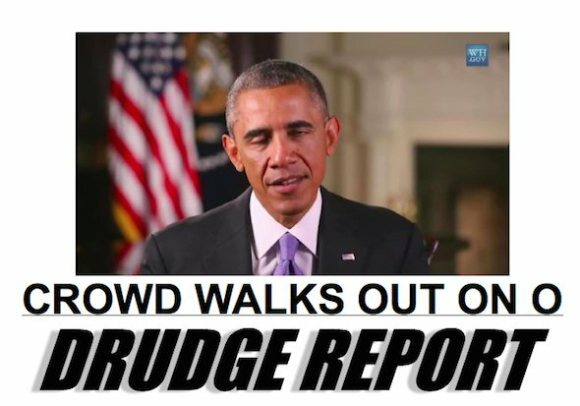 Walking out on the Obamamessiah, The One? Hmm, weren’t there articles just wrote on the importance of the “black” vote in 2014? If energizing the base means the audience leaving as Obama speaks, voting turnout may be a real issue in 2014 for Democrats. The American Thinker makes a very important point, “There is no recovery possible from boring. Once you are tuned-out, you have lost the possibility of revival.” After a while, with the same old false promises, Obama just sounds like Charlie Browns teacher, even to his biggest supporters. 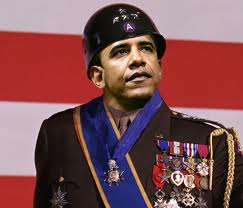 The tin-pot dictator Barack Obama told Congressional leaders he does not need their vote to wage war against ISIS. Isn’t that rich. Even when so many are on board with collectively annihilating ISIS and it is Obama who has been pulled into this kicking and screaming, the president took the opportunity to do what he does best, be negative and divisive. With the polls showing that an overwhelming majority think that Obama has been to lax in dealing with ISIL ISIS and want more action taken against the terror group. So why no vote? Isn’t this the same president who for 6 years has been bitching and moaning about no bipartisanship in Washington? Is this a matter of Obama wanting to go it alone because he is a narcissist, is it because he does not want to show the optic ever of Democrats and the GOP coming together on any issue, or is it because he does not want liberal Democrats to have to vote for war ahead of the 2014 midterms and upset their radical left-wing base? This is what happens when you have a president that does everything with a political taint to it, rather than what is best for America. President Obama told congressional leaders at a White House meeting on Tuesday he doesn’t need their authorization to expand his military campaign against Islamic terrorists. The president offered the assurance one day before a prime-time address he’s scheduled to give to the nation. The president is also weighing the possibility of airstrikes against ISIS targets in Syria, as well as asking the United Nations to pass a binding resolution requiring governments to prevent the flow of foreign fighters to the region. While Obama told the House and Senate leaders he would welcome congressional action that demonstrates a unified front, the president told the bipartisan group “he has the authority he needs to take action against (ISIS) in accordance with the mission he will lay out in his address,” according to the White House. White House press secretary Josh Earnest cautioned that the address would not provide a timeline for the military campaign, nor was Obama expected to outline costs for the operation. Senate Minority Leader Mitch McConnell is emerging as the most outspoken congressional leader pushing for a vote on President Barack Obama’s plan to take on the Islamic State, even as the White House insists the president already has authority to take on the militant group. On Tuesday, McConnell aggressively called on Obama to back a vote in Congress on his military strategy before the November elections, which will pit the GOP leader against Democrat Alison Lundergan Grimes in a pivotal race that could determine control of the Senate. “He really ought to ask for our support, whether or not he may think he’s authorized to do what he intends to do. I think it’s in his best interest,” McConnell told a reporter. And Democratic leaders are also trying to stay out of the fray, though some rank-and-file Democrats in the Senate are agitating for a roll call on continued airstrikes in Iraq or an expansion into Syria. FLASHBACK 2007 … However, that was not always the case. The Gateway Pundit reminds us of Obama, in his own words, criticizing GWB in 2007 for actually going to Congress and getting approval as opposed to Obama who says he does not need Congress to wage for on ISIS. HUH? Bush followed the War Powers Ac in Iraq and that is not good enough for then, Senator Obama. My how times have changed. 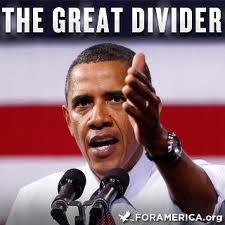 Hear Obama criticize how the president, Congress and the MSM have failed the American people. Did he just say that the MSM reported spin instead of facts? Seriously?